Forklift Drum Attachments to Move and Pour Drum. Morse Forklift-Karriers convert your fork truck into a drum handler. With a Morse forklift barrel dumper, you can lift and dispense a 55-gallon (210 liter) steel drum, with options to handle various other types and sizes of drums. 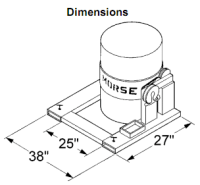 Models are available to dispense a drum weighing up to 2,500 Lb. (1134 kg). MORCINCHTM Options are available to handle a plastic or fiber drum, and even a smaller drum. Select the correct model for your drums. 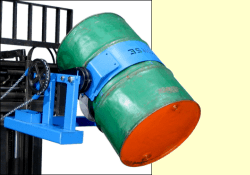 Forklift Drum Attachment Model 285A shown has 800 Lb. (363 kg) capacity. These forklift drum attachments are simple to mount onto your forks. No tools are needed, and no power connections or truck modifications required. Requires 25" (63.5 cm) between forks, as fork pocket openings are 25" (63.5 cm) apart. Each opening is 2.5" (6.35 cm) high by 6.5" (16.5 cm) wide. Custom forklift drum tippers can be made for off-size containers, or with special reach, different fork pocket openings, etc. Calculation of Lost Load Capacity when using Morse forklift attachments. 285A Standard-Duty with MORCINCHTM Drum Holder 800 Lb. 285AM Standard-Duty with Spark Resistant Parts and MORCINCHTM Drum Holder 800 Lb. 285G 3-Piece Drum Holder for 22.5" (57 cm) diameter 55-gallon (210 liter) steel drum 800 Lb. 285A-HD Heavy-Duty with MORCINCHTM Drum Holder 1500 Lb. 285AM-HD Heavy-Duty with Spark Resistant Parts, and MORCINCHTM Drum Holder 1500 Lb. 285G-HD 3-Piece Drum Holder for 22.5" (57 cm) diameter 55-gallon (210 liter) steel drum 1500 Lb. 285A-HDSS Stainless Steel Heavy-Duty Forklift-Karrier	 1500 Lb. 285A-GR Extra Heavy-Duty. Drum holder secures drum with 2 web strap and ratchets. 2000 Lb. 285XGR or 285XMGR Heavily reinforced 3-piece drum holder for 22.5" (57 cm) diameter 55-gallon (210 liter) steel drum, worm gear speed reducer 2500 Lb. 285A-BP Forklift-Karrier with Battery-Powered Tilt and MORCINCHTM Drum Holder 1500 Lb. 285XBP Super-Duty Forklift-Karrier with Battery-Powered Tilt and MORCINCHTM Drum Holder 2500 Lb. 4804i-P Option: Wireless Remote Tilt Control factory installed on Forklift-Karrier with Battery-Powered Tilt 5 Lb. 4804-P Kit for field installation of Wireless Remote Tilt Control on Forklift-Karrier with Battery-Powered Tilt 5 Lb. Half-Full Drum Rating of forklift attachment is an indication of the capacity for tilting an unbalanced, bottom-heavy drum. A partially full drum with an unbalanced and shifting load is harder to tilt than a full drum. Morse Forklift Attachments - Forklift Carrier. Morse Forklift-Karriers - forklift attachments to move and pour drum.